Meftah, T., Zerafat, M. (2016). Nitrate Removal from Drinking Water using Organo-Silane Modified Natural Nano-Zeolite. 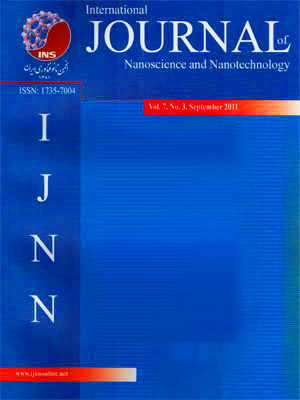 International Journal of Nanoscience and Nanotechnology, 12(4), 223-232. T. Meftah; M. M. Zerafat. "Nitrate Removal from Drinking Water using Organo-Silane Modified Natural Nano-Zeolite". International Journal of Nanoscience and Nanotechnology, 12, 4, 2016, 223-232. Meftah, T., Zerafat, M. (2016). 'Nitrate Removal from Drinking Water using Organo-Silane Modified Natural Nano-Zeolite', International Journal of Nanoscience and Nanotechnology, 12(4), pp. 223-232. Meftah, T., Zerafat, M. Nitrate Removal from Drinking Water using Organo-Silane Modified Natural Nano-Zeolite. International Journal of Nanoscience and Nanotechnology, 2016; 12(4): 223-232.
concentration = 50 mg/l and adsorbent concentration = 4 g/l.